The Lyra Parainfluenza Virus Assay is a multiplex real-time PCR assay for the qualitative detection and identification of viral nucleic acids extracted from nasal swabs and nasopharyngeal swabs from symptomatic patients. The assay has been shown to detect and differentiate parainfluenza virus types 1, 2 and 3. During the test, a multiplex RT-PCR reaction is carried out under optimized conditions in a single tube generating amplicons for each of the target viruses present in the sample. Identification of PIV-1, PIV-2, PIV-3 and the PRC occurs by the use of target-specific primers and fluorescent-labeled probes that hybridize to conserved regions in the genomes of PIV-1, PIV-2, PIV-3 and the PRC. The Lyra Parainfluenza Virus Assay has a convenient, one-step reagent set up performed at room temperature on the bench top, without the need for ice or other cooling accessories. Moreover, optimized cycling conditions make results available in less than 75 minutes following extraction to aid in timely diagnosis and treatment. 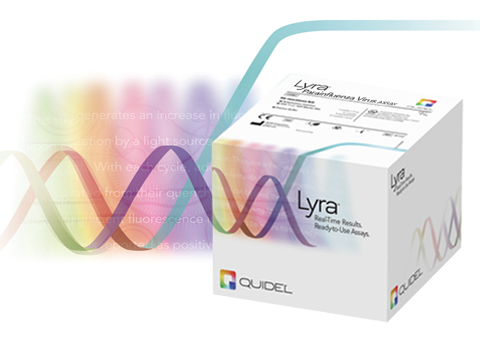 Lyra Parainfluenza Virus RT-PCR is available for use on the Applied Biosystems® 7500 Fast Dx Real-Time PCR Instrument. The Lyra Parainfluenza Virus Assay provides the flexibility to customize respiratory panels with other Lyra Real-Time PCR respiratory assays (Lyra Influenza A+B, Lyra hMPV+RSV, Lyra Adenovirus) that are run under the same cycling conditions in order to adapt to the shifting demands caused by variable local or seasonal disease prevalence.